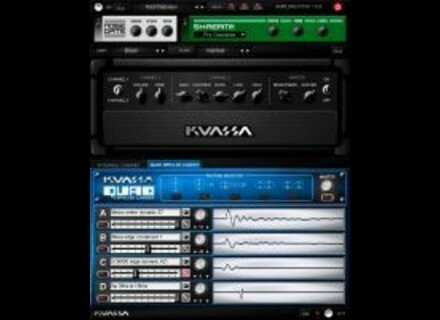 Amplifikation One, Software Amp Simulator from Kuassa in the Amplifikation series. J.Yves's review (This content has been automatically translated from French)" Small but Great !!!!!" I will not dwell too much on this paragraph because there is really nothing .. In the Zip file you will find a manual in PDF, and nothing prevents you to go take a look for fun .. I use the plugin on my PC quad core clocked at 3.0 GHz, plus a sound card ASUS P5Q, 4 GB of ram, and all with Windows XP Pro ..
My audio interface for my big move is just a Toneport UX2 Line 6 ..
Well it all works perfectly and the CPU consumption is very low ..
No audio dropouts or crashes .. I will not hide and too bad for suspense, but this amp sounds virtual god of fire .. Even if I use it with guitars very clear good quality (a Warmoth kit equipped with a microphone .. Joe Barden VGS TD1 Radioactive or PRS Custom 24 not to mention others) that does it feels on the grain quality of this plugin .. Anyway I think (my opinion) that it works well and the sound possibilities are numerous and realistic, very realistic point is also the most stunning ..
We do not frankly legendary amp models, but has the big sound .. I said that I still am a major consumers of virtual amp, because that day I almost all the boards, paid or not .. I would classify the Kuassa gladly in the top three in terms of grain modeling .. I do a lot of comparison between TH1 Overloud of the GTR3 Waves and the Revalver Mk3 in Peavy, well I'm still not the best among these four ..
on the other hand I realized that depending on the guitar used and well this or that work better ..
To return to the comparison and classification should be remembered that the models do not Kuassa not even reverb effects .. It is for me one of the only small downside though it is not so bad .. It will go into its directory of plug in but hey why not ..
You will find in this virtual amp 8 amp, 5 cabins, 5 microphones on adjustable distance, 5 distortion, a compressor gate ..
1 of 8 amps called "custom kuassa" will allow you a selection of preset EQ Extra ..
Another small downside to my taste is that you can use impulses Me ..
Too bad because I like some of impulses in RedWire or Recabinet .. Try to pack Soldano RedWire is not bad at all .. I also feel that 2 or 3 amps are awfully similar to the level of grain but nothing too bad because others will do the job alone ..
You can download a demo version is fully functional for an unlimited life, one breath appear every 40 seconds but nothing nasty .. Nothing to do with the breath of the demo version of AmpliTube 3 from IK Multimedia ..
For about $ 60 Euros TTC, however, higher amount compared to other plug-ins because I remind you that there is no modeled effects, I find this amp remarkable and very readable .. I remake that choice without a doubt and I look forward to a new update .. I use it for several weeks, and I find it really very good. In simulation on computer, as the previous review, I almost tried everything and kuassa addition to my quartet of predilection, namely Revalver mkIII, Overloud TH1 Guitar Amp MAGIX Vandal and excellent plugins Softube, metal amp room and vintage amp room. Going back Kuassa, their app is great (compare what is comparable recess! ), It does not have millions of combinations and the possibility, as was fashionable these days to sound like X or Y, but return, it sounds now! No need to search and spend 8 days trying 10000 combinations that ultimately we do not sound tired and ears more than anything else! I use the simulators for a number of years (since they actually exist!) and I'm tired of having to spend my life on a sound to ring, I buy a simulator for playing guitar, not playing knob! the plugs are choosing a amp, turn 2 or three knobs to adjust and adjust some parameters to our liking, it has not .. that's it! .. s it !.... PLAYING CA ... RING! I think the price of this app is really reasonable if one considers the quality it offers. (I always use the over-sampling x4, which consumes a little more but makes a difference, it would also be an area for improvement) Admittedly this is not the best in the world but if you want it sounds "right out of the box, we put it live on the right track ... if you have some studio stuff very high level, you may be disappointed ... jai tests with medium-range, and it's really not bad. Only drawback, no other effect. So everyone has to find a chorus, reverb, flanger, tremolo etc. .... I use very little effect so AC is not a big problem in my case .. I would rather an advantage, AC can sell the software at this price! there is also a free lite version VST which is based on the custom model content in the paid version, and you can use it with our own IRs. EDIT: The new pay version of the software, now offers the opportunity to load up with 4IRs same time setting the panning, phase and volume ... a great idea anymore! jmdad's review (This content has been automatically translated from French)" SUPERB"
Creme for a good month and one demo model for a week, bought today. It sounds great (Deluxe Stratocaster), he reacted really well to the volume. To have all tried, the TH1 going ahead. But here I am, whenever I used, astonished. The quality / price, I can only understand this small price? Try it your really seeing. In addition, it is a new Indonesian company, which in my view, deserves support. 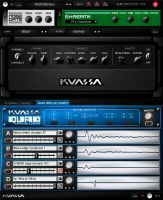 Kuassa has released its Kratos Maximizer, Amplifikation One, and Amplifikation Creme effect plug-ins for Windows and Mac.